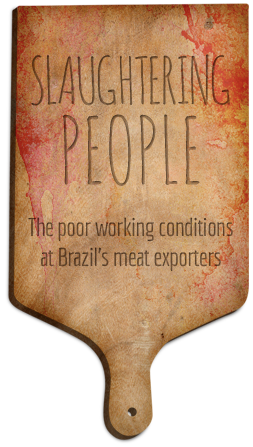 Slaughtering People is a plunge in the universe of workers at Brazil’s main meat companies. Here you will find a multimedia report on accidents, diseases, and other problems resulting from working at plants where fowl, swine, and bovines are slaughtered. The website also presents the largest supermarket and restaurant chains that are clients to those Brazilian meat groups. Besides, it features statements by those companies about problems found at such an important industry within Brazil’s agribusiness. In four years, at Seara’s (the Marfrig group) local meat plant, 440 benefits were requested to INSS by sick workers, according to a technical report issued in August 2011, after a demand by Justice. In February 2008, an employee died after falling from a tractor transporting iron bars. Labour prosecutors found improper medical assistance at the place and workdays of over 15 hours. The leaking of a toxic gas used in leather production at Marfrig’s tannery caused the death of four of its employees in January 2012. In December 2011, Justice sentenced Seara (the Marfrig Group) to provide a crèche to its female employees. The company was also sentenced to grant breaks to employees working at departments with temperatures under 12ºC. In December 2011, according to labour prosecutors, 112 out of 807 employees of Marfrig in Bagé were on leave because of work-related accidents or diseases. At the Hulha Negra unit, they found the same situation in 12% of 1,447 employees. In October 2011, Justice ordered Seara (the Marfrig Group) to grant breaks to its employees working under 10ºC. The company was also ordered to allow the use of restrooms and pay 7.3 million US dollars for moral damages. Labour prosecutors filed at least three lawsuits against Marfrig’s meat plant in Mineiros, GO. The company was sentenced to paying about 1.75 million US dollars for long workdays in unhealthy environments, among other problems. In March 2012, labour prosecutors filed a lawsuit against Marfrig for demanding criminal background checks from its employees. They also accuse the company of not paying insalubrity premium to workers of some departments. In November 2011, Justice ordered JBS to grant breaks to employees working under 12ºC in three units in the state of Goiás. The company was also sentenced to paying 250 thousand US dolars as compensation for collective moral damages. Workers fainting and feeling sick due to very high temperatures led labour prosecutors to file a request to interdict JBS’s slaughter department in November 2010. An employee of one of JBS’s local units had his leg amputated after an accident on a machine in the slaughter department, in February 2012. In August of the same year, the company signed a 5-million-real agreement with labour prosecutors. A former employee says she used to feel pain in her bones and “her hands freezing at work”. In February 2012, Justice ordered JBS not to extend the workday beyond eight hours and to grant breaks to employees in cold environments. Labour prosecutors also demand compensation for collective moral damage. In April 2012, the Mato Grosso Regional Labour Court upheld a lower court decision that ordered breaks for departments under 15ºC. The aim is to protect local JBS employees subjected to strenuous and repetitive work under excessive low temperatures. At the meat unit, 142 accidents were reported between January 2005 and April 2011 –an average of more than one case per month according to labour prosecutors. In March 2012, Justice granted a preliminary order establishing that the company should allow pauses to workers and respect the overtime limit. With 1,850 employees, JBS’s local unit had 496 workers on leave for physical and psychological problems in the first half of 2011, according to labour prosecutors. Justice ordered the company to grant pauses to employees working in “artificially cold” environments. After a meat plant was shut down, labour prosecutors sued JBS for firing 1.3 employees with no previous negotiation. They also demand a 50-million compensation for collective moral damages. In February 2012, the local Labour Court granted a preliminary order establishing that employees working in cold environments should take warm-up breaks. Labour prosecutors ask for a 10-million-real compensation for collective moral damages. An employee died after being crushed in elevator at BRF’s chicken slaughter department, in November 2011. Public prosecutors demand 50 million reais as compensation for risks to the health of the company’s workers, “often incapacitated for work and even for carrying out their everyday activities”. Federal labour prosecutors sued BRF in May 2010 for searching its employees at the end of the workday. They filed a lawsuit for understanding that the procedure violated the intimacy and offended the dignity of workers. In November 2011, the Paraná Regional Labour Court upheld a lower court decision and sentenced BRF in Dois Vizinhos to paying 1 million reais as compensation for illegal outsourcing and degrading conditions imposed to foreign Muslim workers. An employee at BRF’s animal feed factory died after being engulfed by soybean in a silo, in January 2011. Labour prosecutors also sued the company to guarantee breaks for employees working under low temperatures. According to INSS, 20% of BRF’s six thousand employees in town received social security benefits because of diseases along five years. For not counting the time spent to change uniforms as working time for its employees, the company failed to pay them about 12 million reais, according to labour prosecutors’ estimates. In January 2011, BRF had 4.7 million reais blocked for not observing a court decision ordering to grant breaks to employees working in cold environments. Workers at the company’s chick incubator were not allowed to work with their underwear on for alleged sanitation reasons. Between January 2009 and September 2011, about 90 leave requests were filed. In April 2012, Justice sentenced BRF to grant breaks to employees working at departments with temperatures below 12oC and to pay 5 million reais for collective moral damages.